Well, I didn’t like it indeed. I had also a few issues with the vocabulary. Dear author, if you call your magical artifact ka’kari, despite the mandatory fantasy apostrophe the “kaka” part inevitably elicits ironic smirks from me. Let me also say that the term ‘wetboy’, used to describe super-trooper assassins on steroids, magic-endowed and inhumanly good at killing, made me simply laugh. I think the term ‘assassin’ is far more dignified. ‘Wetboy’ makes me think of a small child playing in a puddle. Or wetting his trousers. Apart from that I do think women come in more that two flavours: a staintly madonna or a lascivious whore from gutter. Now a bit about the cover art – it is good but that hood… it seriously limits your field of vision. ;p Just saying. Good ideas, mostly bad execution – in the first part I found just few good scenes scattered around seas of infodumps and such. Recommendable only for teenage action junkies who cannot stop looking for another ‘Assassin’s Creed’ or other videogame-style fantasy. 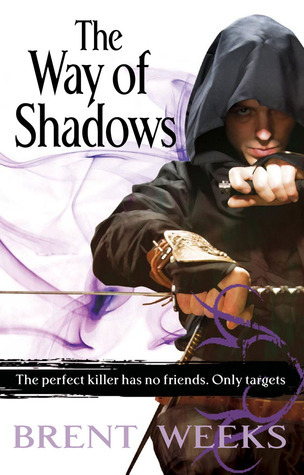 This entry was posted in adventure, book review, crime, dystopia, fantasy, grimdark and tagged breakneck action, brent weeks, meh, no character development, no internal logic, POC author or characters, series alert, the way of shadows. Bookmark the permalink. I am going to steer clear of any of Brent Weeks’s books, series or no series. “Good ideas, mostly bad execution” such a tragic thing when that happens!